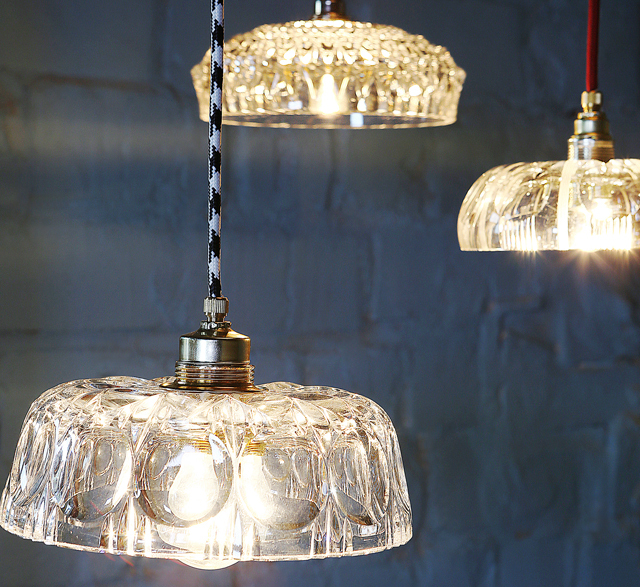 Lighting in the 21st-century can be made from all kinds of repurposed ephemera – and not just glass mason jars. 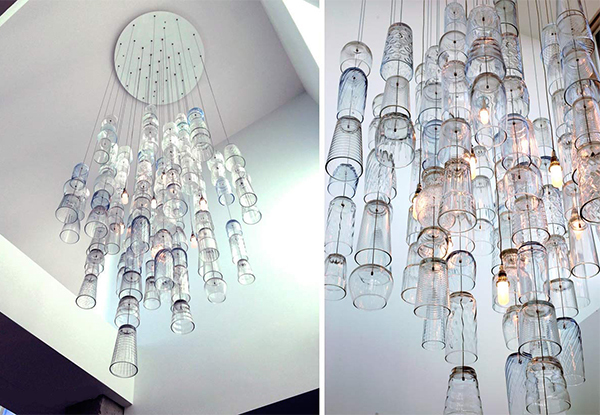 From spectacles to drinking vessels, these works by expert designers show how a resource we have in abundance – ordinary glass objects, can be transformed into stunning statement lighting. 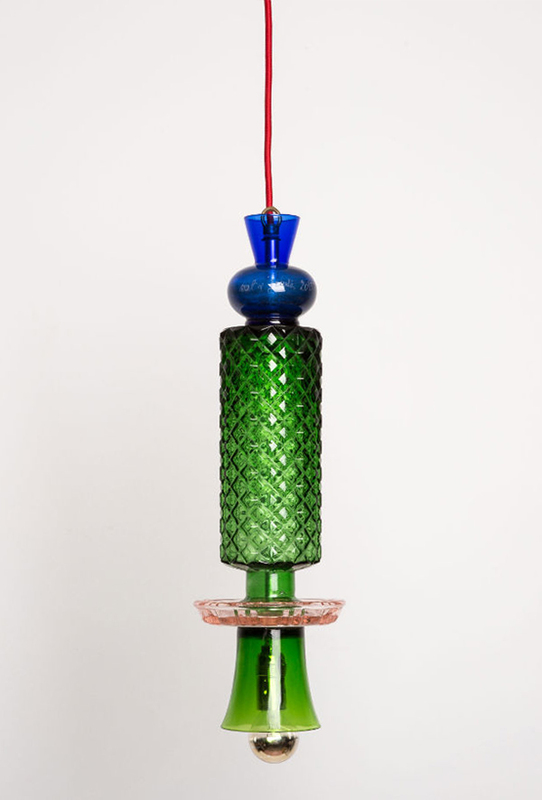 Lucirmás is one of the first European brands to specialise in the upcycling of glass bottles, founded in 2006 by the Italian designer and craftswoman Lucia Bruni. 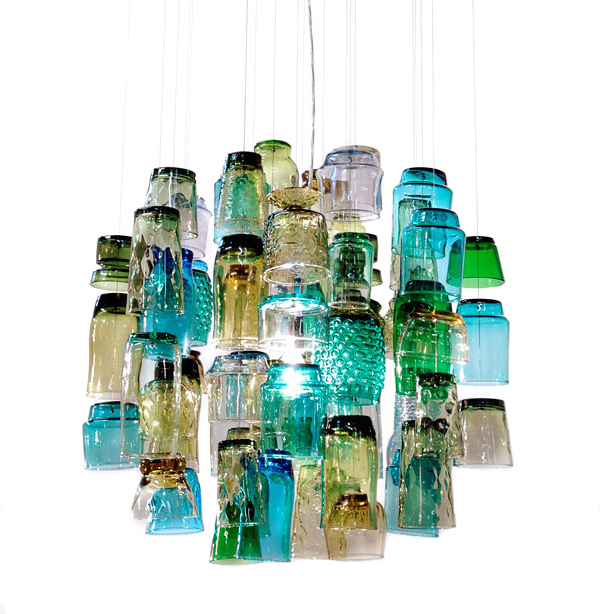 Her creative atelier is based in Barcelona, and aims to create contemporary objects for the home that reflect the charm, value and versatility of recycled glass. 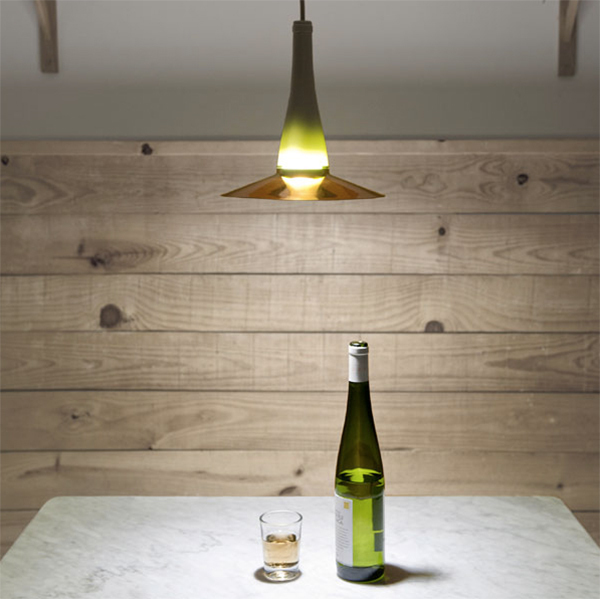 LaFlor pendant lamp (pictured above) combines a reused glass wine bottle and copper screen, all of which can be completely recycled. Glass is sandblasted to remove any sharp edges resulting in simple, elegant products for the home. 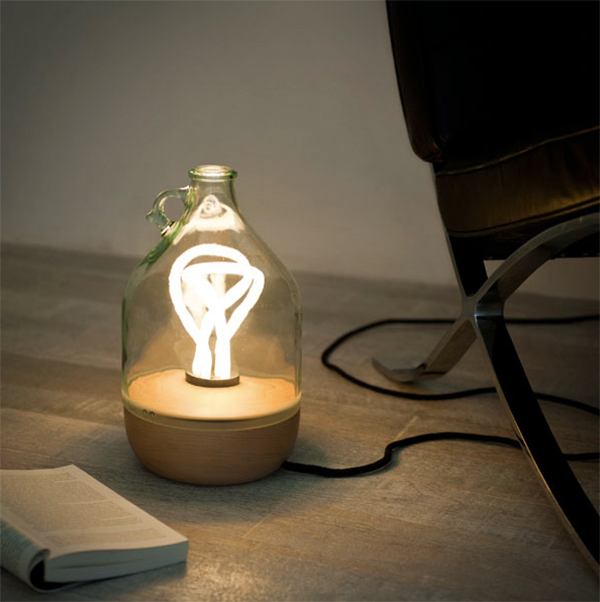 The Dama light pictured above is made from glass bottle and beech wood. Available to purchase via the Lucrimas website. 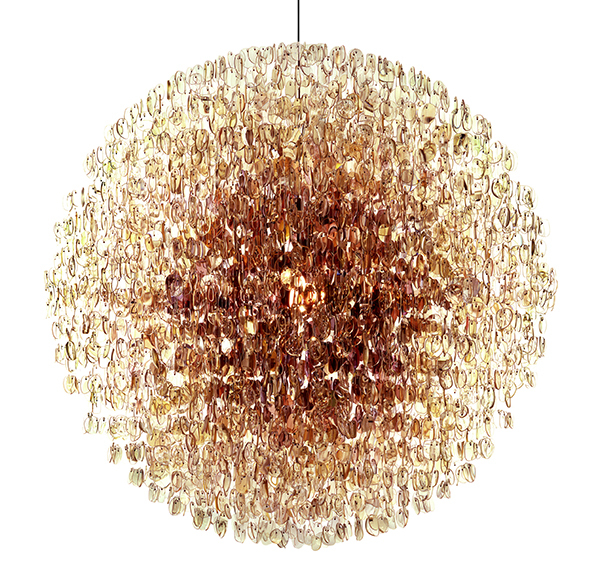 This Optical chandelier by British lighting designer Stuart Haygarth is created from over 4500 prescription spectacle lenses. The lenses are hung from a platform on a monofilament line to form a spherical shape. 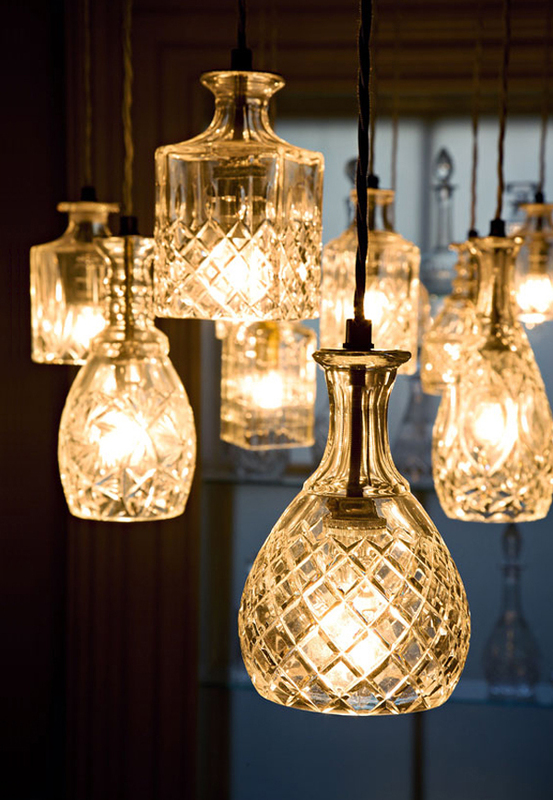 The light is refracted through the many layers of glass lenses, creating a magical dappled display. Hervé Matejewski is the talent behind French design company Mat & Jewski, who first exhibited at the Salon Maison & Objet in 1999. 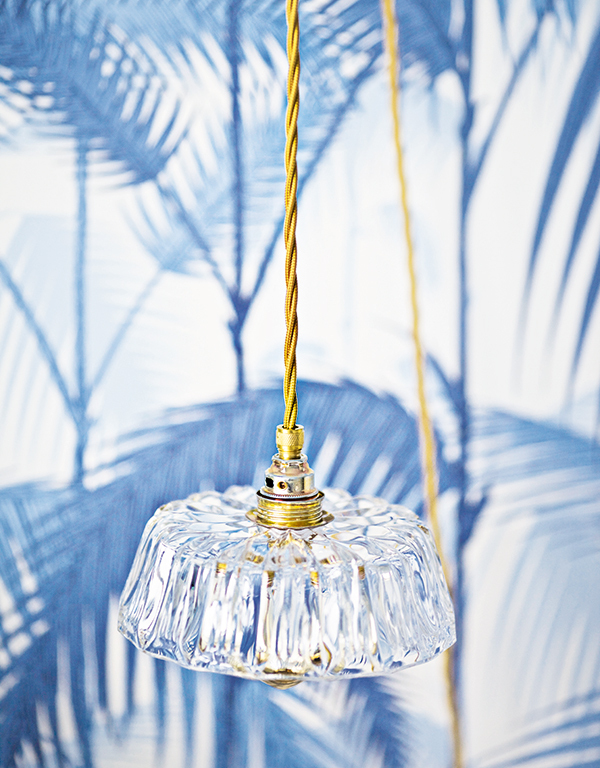 These contemporary lights form one his collections ‘Verre, La Couleur’, beautiful pendant and freestanding lamps made from stacked vintage coloured glass objects. 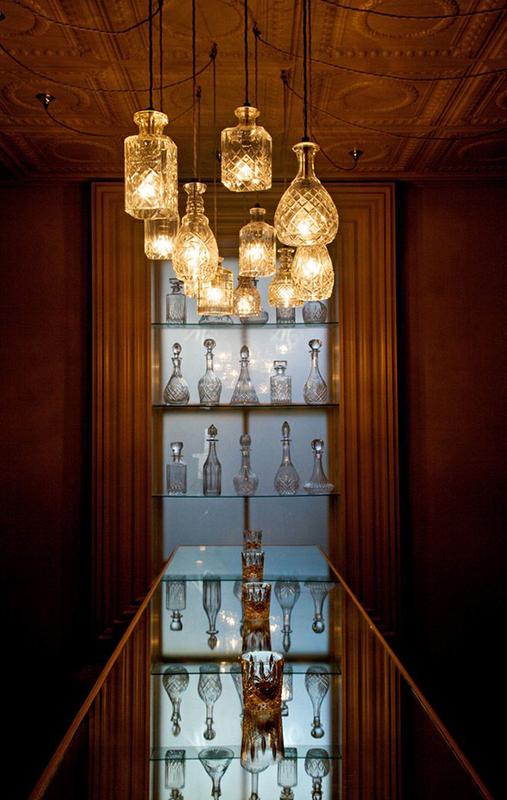 ‘Decanterlights’ designed by Lee Broom were first installed at a West London wine bar, winning him an Elle Decoration award for best interior. The design comprised one tulip, two square and two bell vintage decanters, sourced from antique markets and vintage shops. The design became very popular, so instead of depleting the world’s limited supply of vintage crystal decanters, Lee decided to produce a new version which is now made in the UK from hand crafted and hand cut lead crystal. deForm is a Prague-based design studio set up by Václav Mlynář and Jakub Pollág. 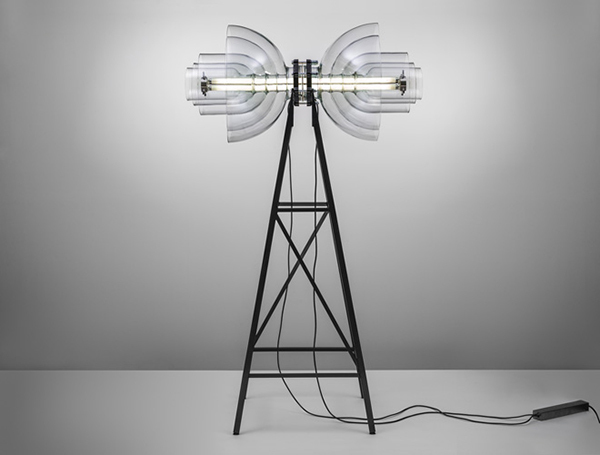 In 2012 they created ‘Transmission’, an experimental light sculpture produced for the Czech glass company Kavalier. The light represented a twist on the five rings of the Olympic games logo. 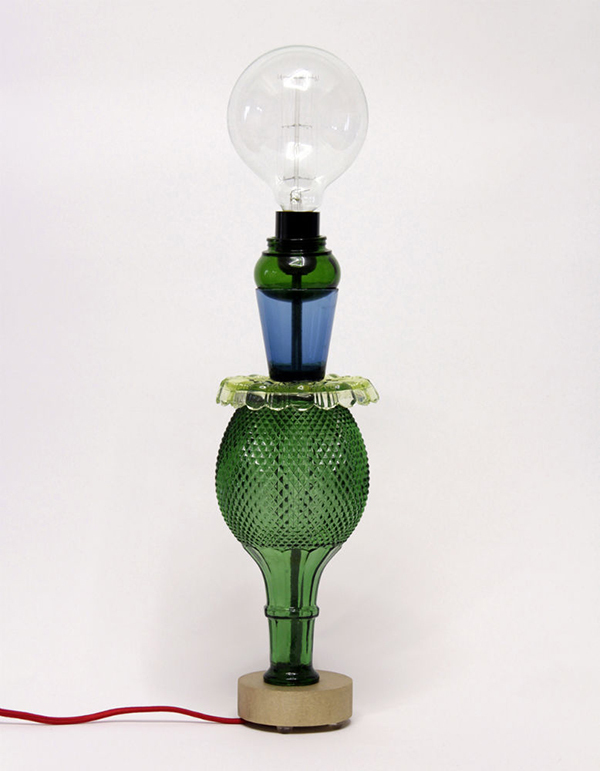 The unique forms of the lights are produced using prefabricated Simax glass flasks originally used in chemical apparatus, joined by a specialist welding technique. Bangalore-based designer Nishi Chauhan is the creator of ‘Dunk’ which won a Red Dot Design award in 2014. 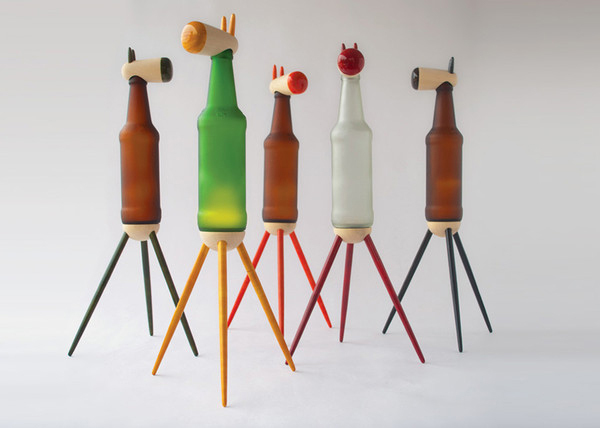 Dunk combines reused beer bottle with lacquered wood painted with natural dyes. It’s described as a warm and friendly fantasy creature that can provide mood lighting to a number of interior settings. Available to order from Nishi directly. 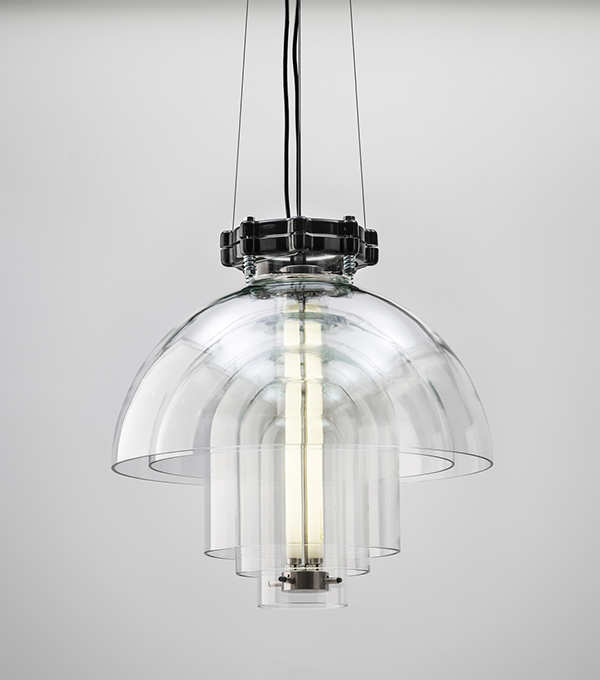 ‘Dram’ is a vintage glass chandelier is by Canadian design company Propellor. The light sculpture is made of 120 salvaged tumblers and drinking glasses, which they describe as “a hallucination of blurred contours, dissolving colours and the ghosts of a thousand intoxicated nights.” Glass vessels are found in second hand shops, garage sales and from friends and family who have forgotten glassware in the back of their cupboards, making each Dram entirely unique. Rafinesse & Tristesse founded their company in 2006. Their products are made from as many recycled items as possible, and include storage benches, children’s miniature kitchens, bar stools and other home accessories. The products are made in both Germany and Switzerland, in cooperation with social projects.